Brazilian company, CVC, has released a series of winter itineraries for the specially chartered Louis Aura, currently sailing in the Greek Islands as the Orient Queen on a three and four night schedule from Piraeus. The deployment to Brazil is the first for Louis, although the ship herself did a season under charter in these waters a few years ago. The 16,000 ton ship-fondly remembered by many as the pioneering Starward of Norwegian Cruise Line- will offer some sixty-three cruise options, commencing with a two night itinerary on November 28th 2103, and concluding with a final sailing on March 26th, 2014. Itineraries will run from two to seven days in length, and concentrate mainly on the northern region of Brazil. Departures from Recife and Cabedelo feature ports of call such as Fortaleza, Natal, and the stunningly beautiful group of islands of Fernando de Noronha. There is no attempt to compete with the series of hectic, seven days sailings usually undertaken by the mega ships. Also, by eschewing the ‘greatest hits’ ports such as Buzios and Rio De Janeiro, the charter company is offering a very different kind of experience to that served up on the mainstream ships. A key factor here is the small size of the ship, which allows her to access smaller, more off the beaten track itineraries not open to the competition. Another is her maximum capacity of around eight hundred passengers, which should facilitate quicker embarkation and debarkation. Louis Aura has one main dining room and an alfresco buffet that also has an indoor area, there are five bars, a two level casino, and two outdoor pools. One of these is partially shaded from the elements. None of the cabins have balconies, but even the smallest insides have private facilities. Pack lightly; the dress code is smart casual, and exactly right for these tropical waters. There is a large show lounge at the forward end of the main deck. 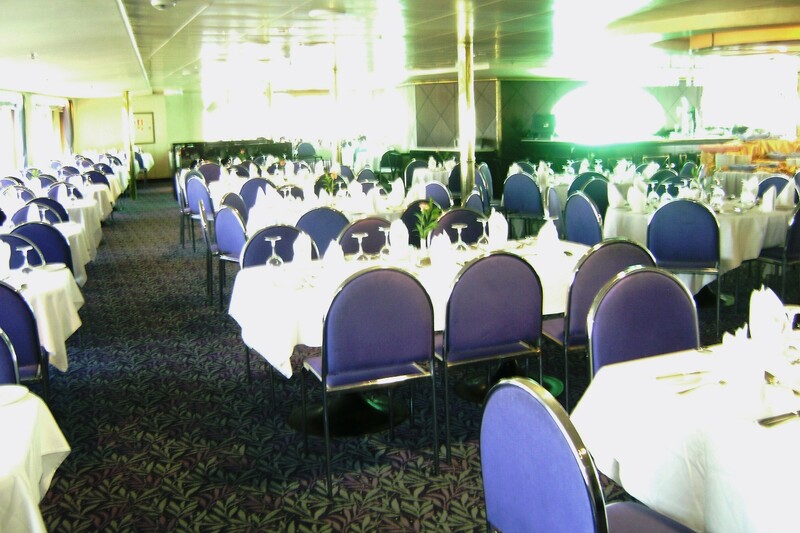 Most public rooms run along the length of deck number five, with the Mermaid Restaurant at the stern. This room has a wall of floor to ceiling glass windows that overlooks the ship’s wake. Louis Aura also has a library, internet centre and small shopping area, as well as an upper deck, Balinese themed spa. CVC celebrated its fortieth anniversary in 2012, and is well known as one of Brazil’s biggest tour providers. No details of the transatlantic crossings have yet surfaced. It is not yet clear whether Louis Cruises will sell these voyages. From mainland Europe, TAP Air Portugal operates services to Recife from it’s main hub at Lisbon’s Portela International Airport. The city is also served by a number of mainstream US carriers. With very grateful thanks to Daniel Capella for his help in linking in to the CVC itineraries. 12/12: Daniel Capella has kindly informed me that these cruises are now being operated by the smaller Orient Queen II, better known to many as the former Spanish cruise ship, Vistamar. This entry was posted in Stylish, elegant travel with some delightful twists and surprises... and tagged Barber, Brazil, cruising, CVC, Louis Aura, Louis Cruises, Norwegian Cruise Line, Orient Queen, Recife, Starward. Bookmark the permalink.